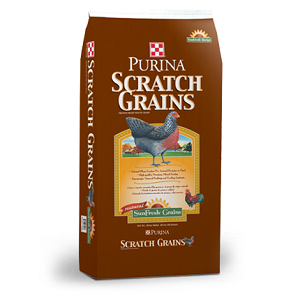 Purina Mills® Scratch Grains SunFresh® Grains is a natural blend of high-quality natural grains designed to be fed free-choice to adult chickens, ducks, geese and turkeys to encourage the natural pecking and feeding instincts. Note that Scratch Grains is a grain supplement, not a complete feed. 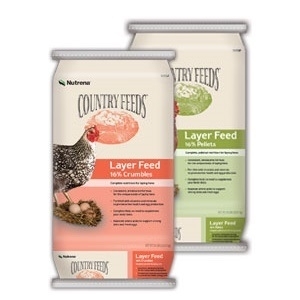 If too much is fed, it will dilute the feed intake of complete feeds such as Start & Grow®, Layena® and Flock Raiser®, reducing the bird’s nutritional intake and overall performance. 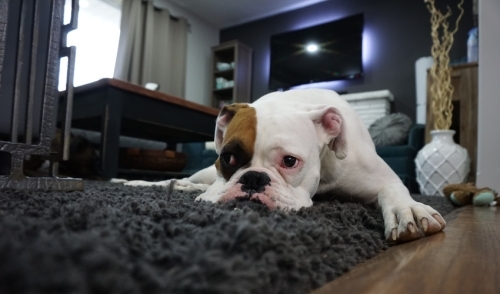 Purina Mills® Scratch Grains SunFresh® Grains should not comprise more than 10% of the birds’ overall diet. 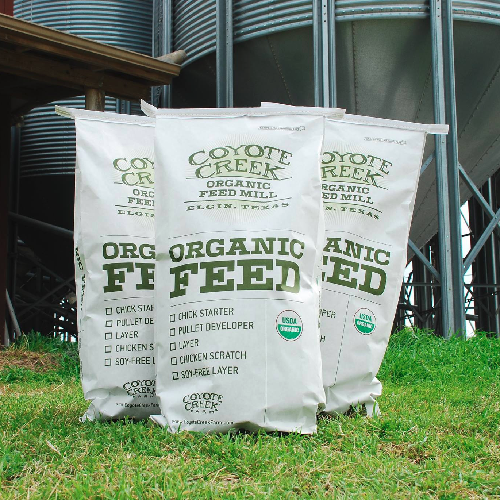 Start your chicks on the right foot with Coyote Creek Organic Chick Starter feed! Your chicks’ health from day one will impact proper egg production once they’ve matured into adult hens. This complete feed formulation is ideal for optimal health, proper growth, and a healthy immune system. Coyote Creek Organic Chick Starter is non-medicated because proper health starts with good nutrition. Feed from hatching through six weeks. Make sure your pullets are in prime condition as they mature into egg-layers! 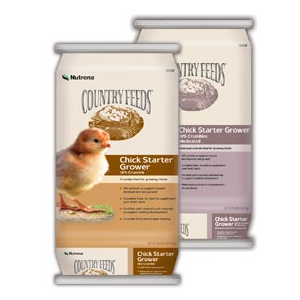 This complete feed formulation is ideal for the growing stage of your teenage chicken (pullet). Coyote Creek Organic Pullet Developer is formulated for optimal health, proper growth, and a healthy immune system. Feed from week seven through week eighteen or until the first eggs appear. Do you want to ensure that your hens produce the most nutritious and tasty eggs possible? This complete feed is formulated for ideal health, a strong immune system, and optimal egg production for your adult hen. Coyote Creek Organic Layer Feed includes the appropriate levels of calcium for proper eggshell strength. Do you want to avoid soy in your diet and prefer eggs from chickens who have not eaten soy? This complete feed is formulated for ideal health, a strong immune system, and optimal egg production for your adult hen and it includes the appropriate levels of calcium for proper eggshell strength. Coyote Creek Organic Soy-Free Layer Feed is great for those who are sensitive to soy and wish to avoid it in their diet. This complete feed formulation is ideal for optimal health, proper growth, and a healthy immune system. Coyote Creek Organic Broiler is non-medicated because proper health starts with good nutrition. Feed from three weeks of age until harvest. 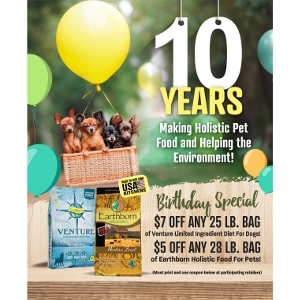 The best treat around – your chickens will thank you! Coyote Creek Organic Scratch is a great mix that can be used to promote positive behaviors like scratching in the dirt and exercising. Use chicken scratch in your garden beds to have the chickens turn your soil for you, scatter it around the yard to promote exercise, or use it as a treat! New Honor® Show Chow® Poultry Prestarter is a nutritionally complete, balanced ration for newly hatched broilers and turkeys. This 30% protein diet is designed to develop chicks and poults to their full genetic potential. Honor® Show Chow® Poultry Prestarter can be followed by Honor® Show Chow® Poultry Starter, Poultry Grower and Poultry Finisher to get birds ready for show. Honor® Show Chow® Poultry Prestarter is supported by Purina’s knowledge, experience and research. New Honor® Show Chow® Poultry Starter is a nutritionally complete, balanced ration for broilers from 15 through 22 days of age and turkeys from 9 through 12 weeks of age. This 26% protein diet is designed to continue the development of chickens and turkeys to their full genetic potential for shows. Honor® Show Chow® Poultry Starter can be preceded by Honor® Show Chow® Poultry Prestarter, and followed by Honor® Show Chow® Poultry Grower and Poultry Finisher to prepare birds for show. 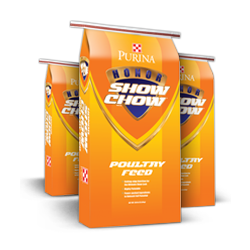 Honor® Show Chow® Poultry Starter is supported by Purina’s knowledge, experience and research. New Honor® Show Chow® Poultry Grower is a nutritionally complete, balanced ration for growing broilers from 23 through 35 days of age and turkeys from 13 through 16 weeks of age. This 24% protein diet is designed to continue the development of chickens and turkeys to their full genetic potential for shows. Honor® Show Chow® Poultry Starter can be preceded by Honor® Show Chow® Poultry Prestarter and Poultry Grower, and followed by Honor® Show Chow® Poultry Finisher to prepare birds for show. Honor® Show Chow® Poultry Grower is supported by Purina’s knowledge, experience and research. New Honor® Show Chow® Poultry Finisher is a nutritionally complete, balanced ration for growing broilers from 36 days of age to show and turkeys from 17 weeks of age to show. This 21% protein diet is designed to continue the development of chickens and turkeys to their full genetic potential for shows. Honor® Show Chow® Poultry Finisher can be preceded by Honor® Show Chow® Poultry Prestarter, Poultry Starter, and Poultry Grower to prepare birds for show. 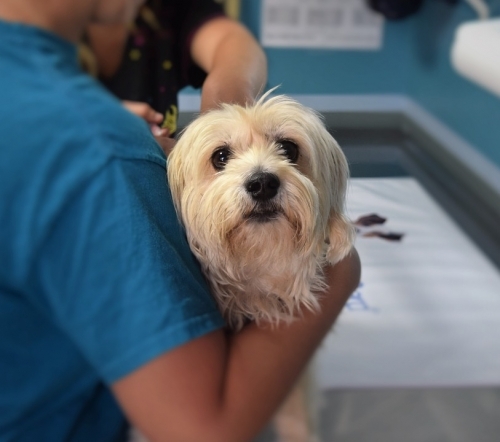 Honor® Show Chow® Poultry Finisher is supported by Purina’s knowledge, experience and research.